There are 136 Assisted Living Facilities in the Canoga Park area, with 2 in Canoga Park and 134 nearby. The average cost of assisted living in Canoga Park is $2,800 per month. This is lower than the national median of $3,346. Cheaper nearby regions include Winnetka with an average starting cost of $2,750. To help you with your search, browse the 321 reviews below for assisted living facilities in Canoga Park. Better rated regions include Winnetka with an average rating of 5.0 out of 5 stars. Caring.com has helped thousands of families find high-quality senior care. To speak with one of our Family Advisors about assisted living options and costs in Canoga Park, call (855) 863-8283. Canoga Park is a residential community on the western hub of the San Fernando Valley, a far-western suburb of Burbank and the last Valley stop on the way to Thousand Oaks. Around 25,000 people live in this part of the Valley, about 19 percent of them seniors aged 65 and above. At least 136 assisted living facilities operate in and around Canoga Park to provide safe and comfortable residential care for seniors. All assisted living communities in the state, including those in Canoga Park, are licensed through the California Department of Social Services' Community Care Licensing Division. The weather in Canoga Park verges on the semi-arid, with long and warm summers that average highs of 88 degrees. Winter lows average 41 degrees in Canoga Park, as they do in the rest of the San Fernando Valley, all the way east to Burbank. This part of the Los Angeles area tends to get 17 inches of rain a year, which falls mostly in winter. The cost of living in Canoga Park can be roughly double the national average. This is high by national standards, but less so for California, where the average cost of living is already 69 percent above the national rates. Healthcare is comparatively affordable in Canoga Park, where seniors pay an average of 15 percent less for healthcare than rates nationally. Crime rates in Canoga Park are just two-thirds of the national average rates. Rates of violent crime in Canoga Park are especially low, leaving the rest of the reported crime stats mostly as property offenses and petty theft. Public transportation in Canoga Park is in the hands of the Los Angeles Metropolitan Transit Authority (Metro) service, which operates bus and rail lines throughout Los Angeles County. Seniors with valid transit passes get discounts on all scheduled fares on the Metro, and the service provides dial-a-ride and assisted van transport with same-day booking to most areas. The Canoga Park area is home to world-class medical facilities, including those specializing in brain health and dementia care such as Dignity Health - Northridge Hospital Medical Center and UCLA Health, in the event of medical emergencies or illness. Canoga Park, as a township in Los Angeles County, is a member of the AARP Network of Age-Friendly Communities, meaning that its elected leadership “has made the commitment to actively work toward making their town, city or county a great place for people of all ages,” according to AARP. Assisted Living costs in Canoga Park start around $2,800 per month on average, while the nationwide average cost of assisted living is $4,000 per month, according to the latest figures from Genworth’s Cost of Care Survey. It’s important to note that assisted living rates in Canoga Park and the surrounding suburbs can vary widely based on factors such as location, the level of care needed, apartment size and the types of amenities offered at each community. 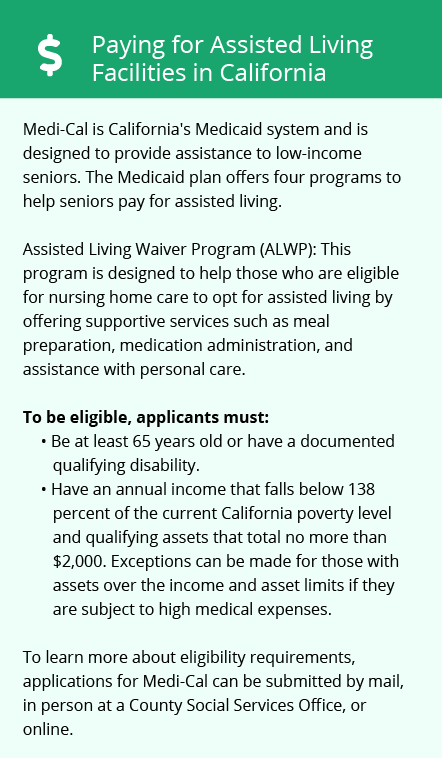 Seniors in Canoga Park who meet the federal income and asset guidelines for Medicaid eligibility may qualify for a Home and Community Based Services (HCBS) waiver. 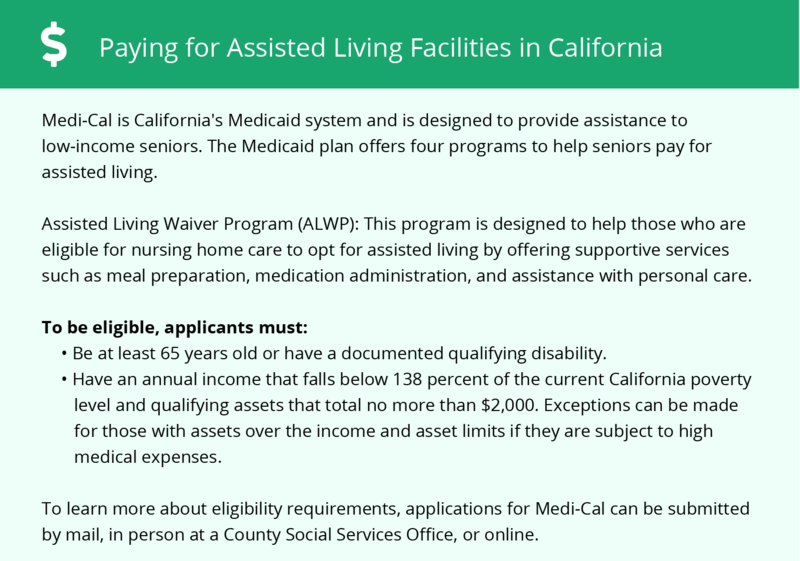 This waiver helps seniors in 15 California counties pay some or all of the cost of assisted living. Canoga Park and the surrounding area are home to numerous government agencies and non-profit organizations offering help for seniors searching for or currently residing in an assisted living community. These organizations can also provide assistance in a number of other eldercare services such as geriatric care management, elder law advice, estate planning, finding home care and health and wellness programs. To see a list of free assisted living resources in Canoga Park, please visit our Assisted Living in California page. Canoga Park-area assisted living communities must adhere to the comprehensive set of state laws and regulations that all assisted living communities in California are required to follow. Visit our Assisted Living in California page for more information about these laws.